Sowerby, 1866, Conch. Icon. : pl. 46, sp. 249. Simpson, 1900, Proc. U.S. Nat. Mus. : 759. Simpson, 1914, Descr. Cat. Naiades: 780. Frierson, 1927, Check List N. Amer. Naiades: 42, sp. 175. Haas, 1969, Das Tierreich: 256. Burch, 1975, Freshw. Unio. North Amer. : 13. Turgeon et al., 1988, Am. Fisher. Soc. Spec. Publ. : 32. Williams et al., 1993, Fisheries: 13. 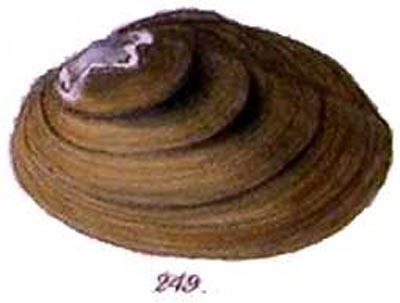 Parmalee & Bogan, 1998, The Freshwater Mussels of Tennessee: 184. Lydeard et al., 1999, Gulf Mex. Sci. : 129. + Pleurobema hanleyianum (Lea, 1852). — Parmalee & Bogan (1998: 184).